The Samadhirajasutra is one of the essential canonical texts of the Mahayana Buddhism. Dating from perhaps the second century A.D. it presents an early form of the doctrine of the void (sunyavada), one of the principal philosophical doctrines of the Mahayana. In this respect the Sutra is of fundamental philosophical importance; it is notably of major authority for the Madhyamaka school which is sunyavadapar excellence. The present work contains three philosophical chapters of the Sutra, viz. VIII, XIX and XXII, giving an approximate idea of the doctrinal standpoint of the Sutra. These three chapters have not been selected arbitrarily. 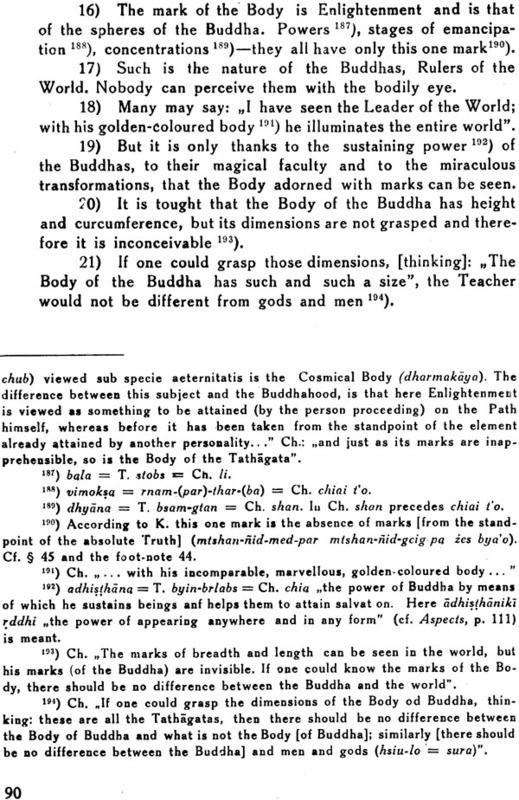 Chapter VIII treats of the inexistence of dharmas; Chapter XIX of the identity of their essence; Chapter XXII treats of the nature of the bodies of the Buddha. These are all essential themes of the philosophy of the Great Vehicle and sunyavada. This is a reprint of the 1938 Warsaw edition comprising an Introduction, Sanskrit and Tibetan Texts and the English Translation by K. Regamey, which was almost wholly lost to the public in Warsaw's destruction during the Second World War. Konstanty Regamey (1907-1982) was born in Kiev of a Swiss family which had emigrated to Russia in the 19th Century. He fled from Russia to Poland in 1917 and subsequently to Switzerland in 1945. He had a double career, being both a musical composer and an orientalist. 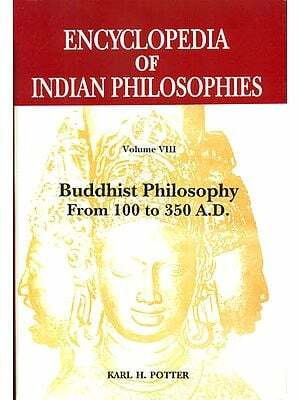 In the domain of orientalism his preferred field was "Buddhist Hybrid Sanskrit" which was the vehicle for the canonical literature of Mahayana Buddhism in India. 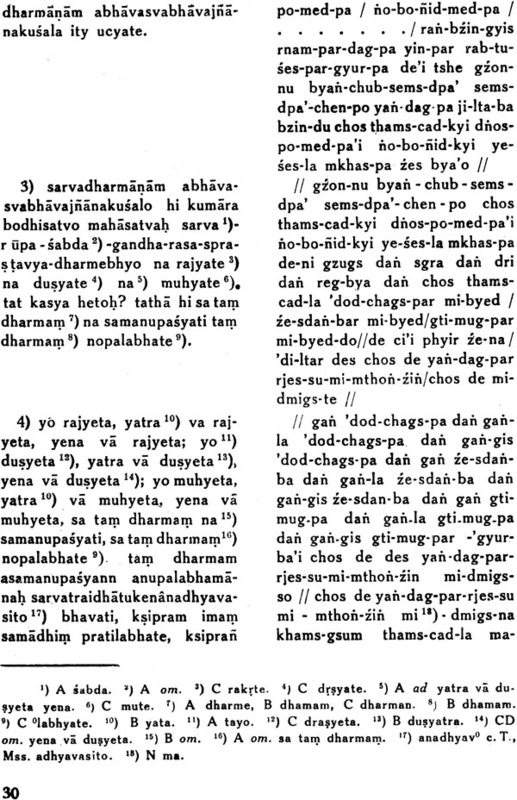 Regamey's interest in this literature was not just linguistic, but also philosophical, as it evidenced by his translation of the Three Chapters from the Samadhirajasutra and the Bhadramayakaravyakarana. Konstanty Regamey (1907-1982) was born in Kiev of a Swiss family which had emigrated to Russia in the 19th century. He fled from Russia to take refuge in Poland in 917 and then subsequently from Poland to Switzerland in 1945. He had a double career, being both a Musical composer and an orient list. 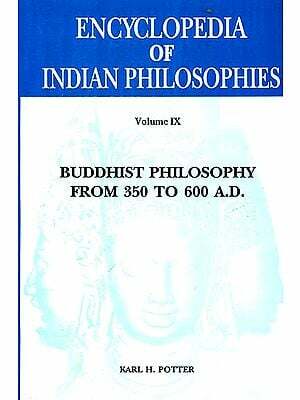 In the domain of orientalism, his preferred field was the language which Franklin Edgerton had termed “Buddhist Hybrid Sanskrit”, and which was the vehicle for the canonical literature of Maliãyant Buddhism in India. K. Régamey’s interest in this literature was not just linguistic, but also philosophical, as is most remarkably witnessed by his edition and translation of Three Ghapters from the Samadhirajasutra, first published in Warsaw in 1938 and now reprinted through the good offices ofMotilal Banarsidass under the title, Philosophy in the Sarnadhi rd jasütru. Originally, this work was the doctoral thesis of K, Régamev, a thesis defended at the University of Warsaw in 1936. The Samadhirajasutra is one of the essential canonical texts of Great Vehicle Buddhism. 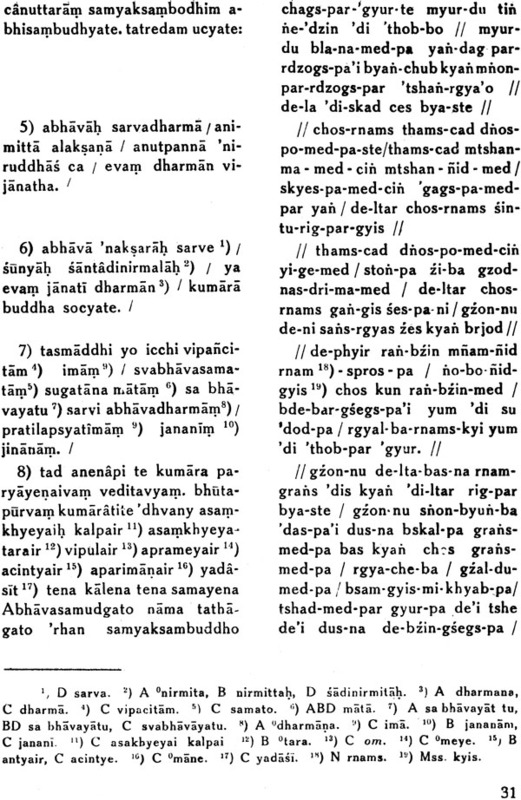 Dating from perhaps the second century AD., it presents an early form of the doctrine of the void (hinyavada), one of the principal philosophical doctrines of the Mahayana. In this respect, the sutra is of fundamental philosophical importance; it is. notably, of major authority for the Madhyanaka school, which is mt1ya-vada par excellence. The three chapters (VIII, XIX and XXII) chosen by Regamey were not selected arbitrarily. 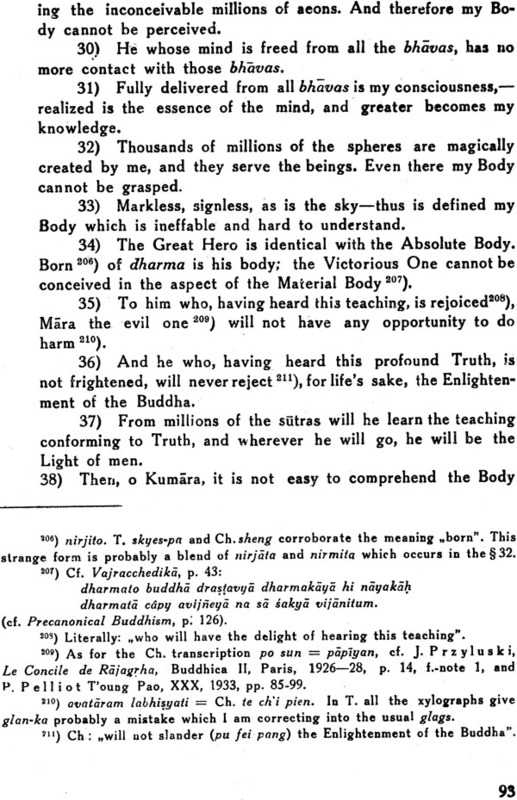 Chapter VIII treats of the inexistence of dharmas: Chapter XIX of the identity of their essence; Chapter XXII treats of the nature of the bodies of title Buddha. These are all essential themes of the philosophy of the Great Vehicle and sunya-vada. 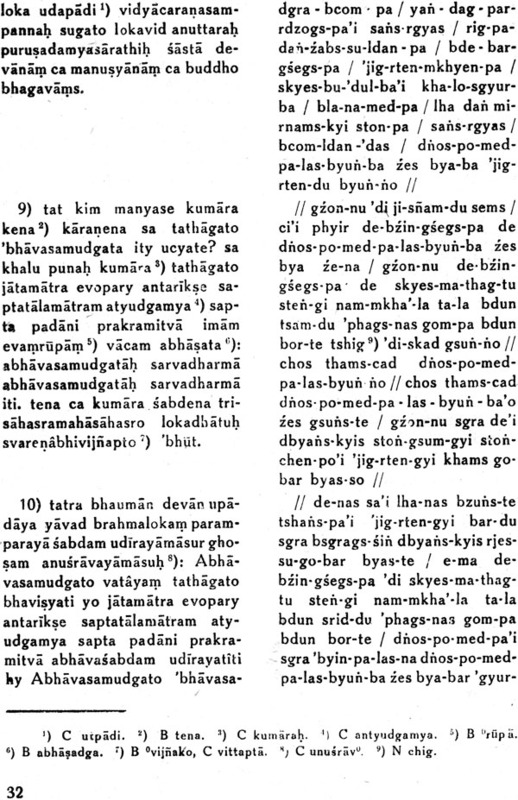 Even today, Régamey’s work is the only one which treats the Samadhiraja with the rigor demanded, both in its textual critique and its linguistic and philosophical approaches. Regamey and Ids teacher, Stanislaw Schayer, had envisaged an edition of the whole Samadhiraja. But the project was cut short by the Second World War, and nothing more of it ever appeared apart from the three chapters chosen by Régamey. The editions of Dutt and Vaidya have the merit of presenting us with a complete text, neither is critical. As for a translation, Jean Filliozat had worked on this task for a long time in his courses at the Ecole Pratique des hautes etudes in Paris; it seems that he may have left us a manuscript of an integral translation, hut it remains unpublished to this day. In warsaw’s destruction in 1944 everything of Regamey work disappeared manuscripts as well as the stocks of bookstores. Being a doctoral thesis the three chapters had been sent around to some extent nonetheless it still remained difficult to find it bookstores. We see then the and equally because of its interest for Mahayanist Buddhist literature and thought. Among the, 9 Dharmas” of Nepal, Samadhirajasutra is the only one of the greater texts which is less known and not completely edited as yet. It is rather surprising, considering that the text was very important, as testified by the numerous and extensive quotations in the later Buddhist literature. 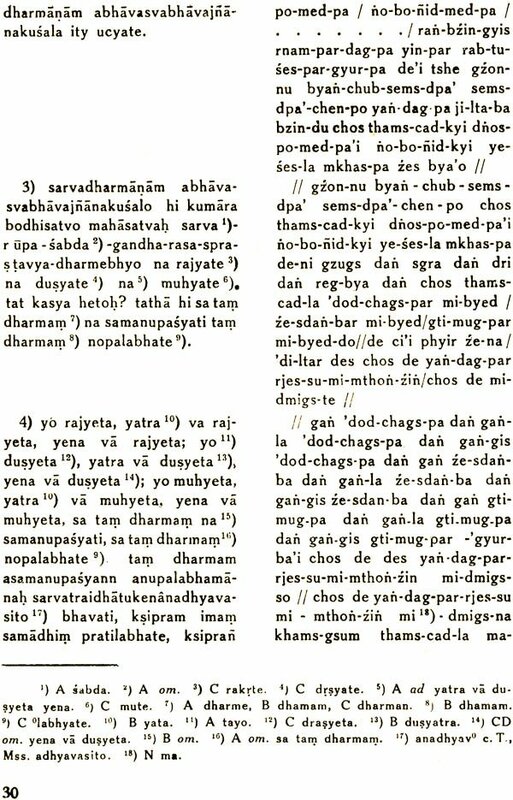 The Samadhirajasutra is one of the most authoritative texts for Candrakirti and Sàntideva, very often quoted ii the works of these famous writers. As Professor Stanislaw Sc ha ye r and myself intend to bring out an edition of the whole text, the present work is but preparatory, and presents as a specimen of the Samadhirajasutra three philosophical chapters: VIII, XIX and XXII, giving an approximate idea of the doctrinal standpoint of the sutra. It is obvious that these three chapters are not sufficient to convey all the characteristics of the entire sutra. Consequently, I refrain from drawing any general and premature conclusions for the present, while analyzing only the principal features of the above chapters. As our intended systematic edition will be accompanied by a volume containing the Sanskrit— Tibetan—Chinese indices the present work will include but a list of Chinese words quoted in the text and an index of the most important terms. 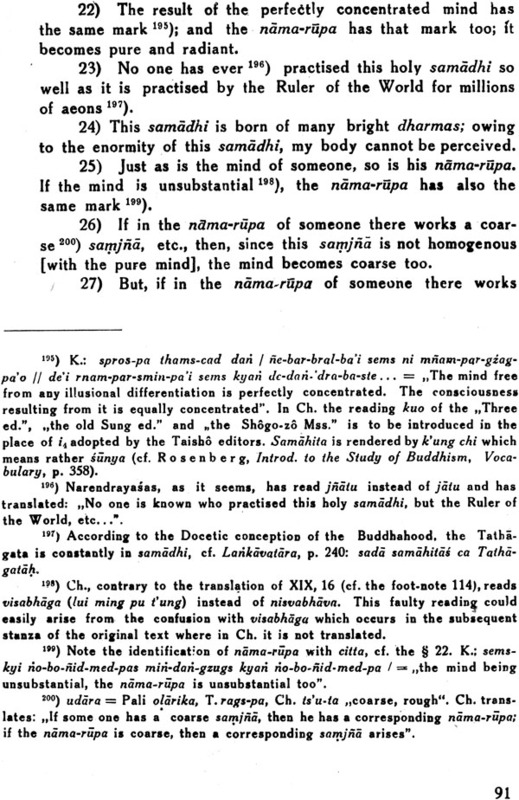 The small size of the present work, bow ever, allows me to give more attention to the Tibetan and Chinese versions, and to make greater use of the Commentary of Manjusrikirti on the Saniadhirajasutra. The same reason enables me to treat in detail the linguistic features of those chapters. I avail myself of the opportunity to express my sincerest gratitude to Professor St. Sc hay e r for the unceasing and the invaluable help which ho was kind enough to render in the preparation of my work. The foot-notes of my book prove but very imperfectly how such I owe to Prof. Helmer S m it b, and I can hardly miss this occasion in giving my sincerest thanks to him. It gives me also a great pleasure in acknowledging my indebtedness Mademoiselle Marcelle Lalou and to Prof. Jan Jaworski who very kindly helped me in all the subjects concerned with Tibetan and Chinese respectively. My grateful thanks are due to all the persons whose suggestions allowed me to solve some difficult problems of my work, specially to Prof. Jean Przyluski and to Prof. Jules Bloch. Mr. Hiranmoy Ghoshal deserves my best thanks for having revised my English. The acknowledgement of my indebtedness will not be complete unless I express my profound gratitude to the authorities of the Fundesz Kultury Narodowej and of the Kasaim miranowskiego without whose kind help this book would have remained unpublished. 1. 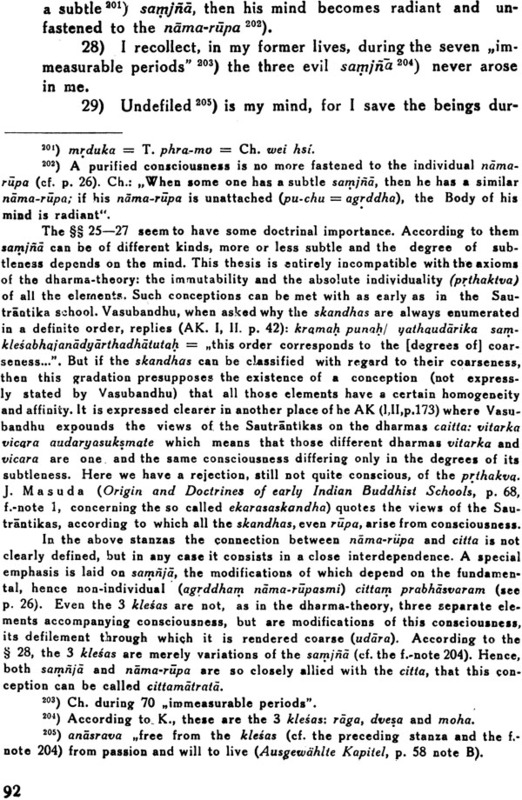 The edition of Sarat Chandra Das and Harimohan Vidyabhusan in the Buddhist text society (series 4) of which there appeared only the first fascicle (Calcutta 1896) containing the chpts I-XVI it is an uncritical edition does not correct the errors of the Ms. And contains a great number of false readings. 2. 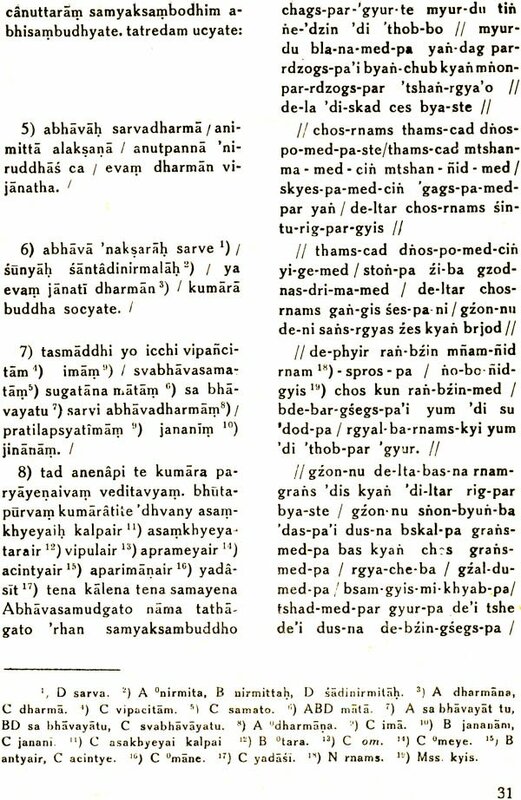 Quotations in the Buddhist Literature Especially in the Prasannapada of Candrakirit and in the Siksasamuccaya of Santideva. A. Fonds Sanskr. 144/145, chpt.VIIIf. 29a-32a, chapt. XIX f. 79a-82a, chpt. XXII f. 91a-94a Bibliotheque Nationale Paris. These are unfortunately late copies dating form the beginning of the XIXth century and containing numerous mistakes. They can be divided into two groups. A and D which show a very close agreement give the best readings B and C also agree but C Contains a greater numbers of errors. All the four are written in Nepalese character except C where beginning from f. 167a one finds a very fine nagari. The division into chapters is identical in all the Mss. Except for the last chapters. In my edition I have preserved the numbering of Chpts as it was in the Mss, but have introduced my own division into ss. In the quotations the Roman and the Arabic figures indicate respectively the chpts and the ss. 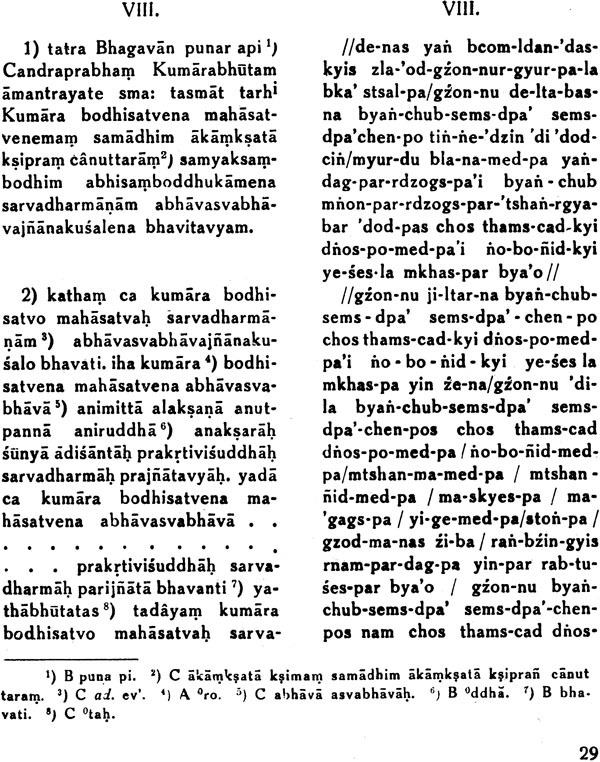 I have made extensive use of the commentary on Samadhraja of Manjusrikirti entitled Kirlimala and preserved in Tibetan version only: Pags-pa-chos-thams-cad-po zes bya-ba theg-pa chen-po o grel-pa, grags-pa-, phreri-ba zes bya-ba tanjur, Mdo-grel XXXVIII (Cordier 233).